The boys like to make a list of things they want to do during the school holidays. For Boy 1 this usually involves riding around on buses. I was planning to encourage them to do lots of outdoor things, like planting and running about in the woods, but it’s been too wet. Boy 2 wanted to make a hand puppet, a nice, quiet, wet day activity! He also wanted me to show him how to sew, so I was able to combine both things and teach him how to sew two bits of fabric together and how to make a glove puppet! First we needed a template. A quick google brought up lots of results 🙂 but unfortunately I couldn’t get the printer to work, so I had to make the template myself. Thankfully this was easy to do. I drew round my hand with fingers together, not spread out, then added a head and some arms to the shape. 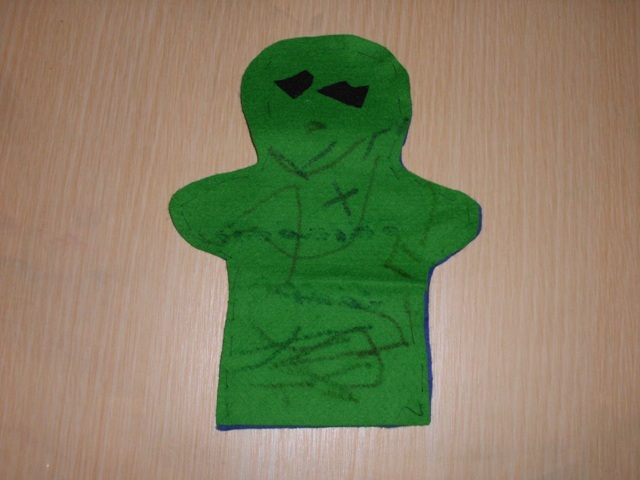 Using Boy 2’s hand, I checked that it was the right size, so that once it was sewn up, he would be able to get his little hand into the puppet and move its head and arms. 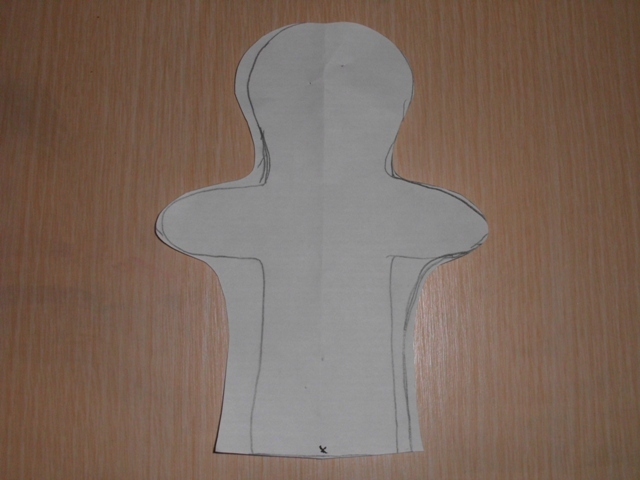 Some small alterations were needed to the puppet template, mainly in the armpit area, then I was able to cut out the pieces. 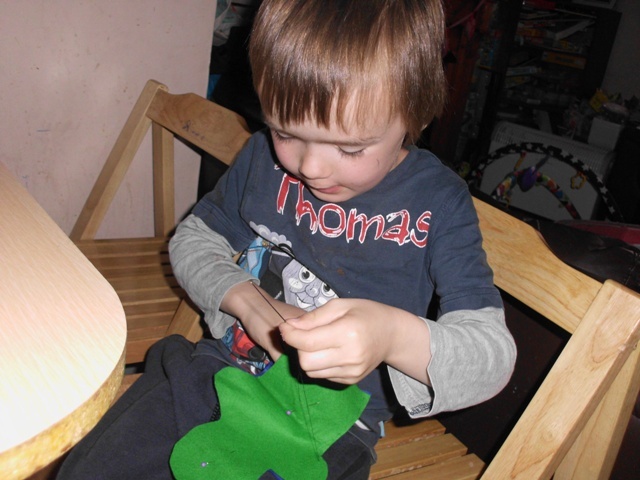 Boy 2 had a go at cutting out his own pieces but the felt was quite thick. Boy 3 changed his mind after I had cut his out. He decided that he did want a pink puppet after all. I sewed Boy 3’s glove puppet up on the sewing machine, by which point he had lost interest. Boy 2 however was determined to sew up his puppet himself. I showed him what to do, to his irritation, as he said he already knew what to do! A quick tutorial later and he was away!